Share "Holiday Plants – The Gifts That Keep On Giving"
Plants are popular holiday gifts that recipients can enjoy long after festive feasts are eaten, glittery decorations are packed away and joyous carols are silent. In fact, many holiday plants can flourish for years, reminding that someone special of your caring and thoughtfulness no matter what the season. But which plants are the best to give as holiday gifts? These classic and familiar plants make a stunning holiday gift. The broad, colorful petals are actually the plant's leaves, and can be red, pink, white, magenta, orange, salmon, purple or variegated shades. 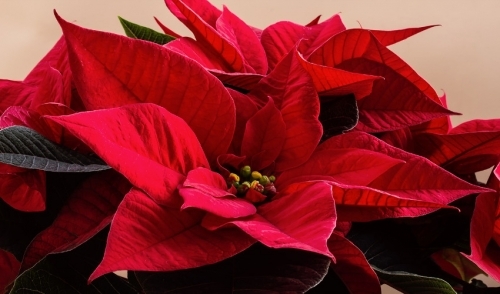 Poinsettia sizes vary, and their bushy, mounding shape is ideal for centerpieces and bold arrangements. This bold bulb grows thick, upright stems with large, stunning blooms in red, white, pink, peach, orange or variegated hues. These plants are easy to care for and are stunning accents around a holiday home. Also called white narcissus or paperwhite narcissus, these small, upright blooms grow from bulbs and can be several inches tall. They are often arranged in groups to create a snowfall effect when they flower, and binding the stems with ribbon adds an extra festive accent to the plant. Not really a cactus but actually a succulent with flattened, lobe-like trailing foliage, these plants bloom in the winter in bright red, pink, orange or purple shades. Properly cared for they can live for many years, reliably reblooming to celebrate each holiday season. These pines can be beautiful house plants with the soft, pliable needles and spreading branches. They can be decorated as living Christmas trees or even grown to plant outdoors in the landscaping. A fragrant and delicious herb, rosemary is often trimmed into a tree-shaped bush to be a fun holiday gift. Not only are these beautiful plants, but they can be used to deliciously season a wide variety of savory holiday meals, making them just as practical as they are attractive. A low mounding perennial with broad green foliage, the red, pink or white blooms of cyclamen are stunning decorations for the holidays. These plants will bloom prodigiously for weeks, and need very little care to stay beautiful all season long. A winter-blooming succulent, kalanchoe brings a beautiful touch of the tropics to winter homes. The flowers sprout in tiny clusters that may be yellow, peach, pink or other shades. New plants can easily be grown from the cuttings of healthy, vibrant plants. The ultimate in easy-care, hard-to-kill plants, Lucky Bamboo arrangements are available with different numbers of stalks as well as elaborate twists, turns and curls. A more exotic option for a holiday gift, these plants will always be welcomed and appreciated. A plant doesn't have to be a traditional holiday option to be a good gift choice. Select the gift recipient's favorite plant types, or choose any plant they might enjoy. Succulents, air plants or even heirloom seeds are all fun choices that can be thoughtful gifts. Choose only a lush, healthy plant, and carefully trim off any wilting or discolored foliage or blooms as needed to help the plant look its very best. Consider adding a top dressing to cover the soil and create a neat appearance. Gravel, moss, marbles and crushed shells are lovely options. Water the plant 2-3 days before giving it away so it will be lush and vibrant but will not be leaking any excess water or wet soil. Include the plant's care instructions with the gift so the recipient will know how to keep the plant healthy and thriving long after the holidays. Decorate the pot with a foil cover, ribbons or other accents to give it a festive presentation suitable for a gift. A plant can be a great gift for a friend, neighbor, coworker, family member or anyone else during the holidays. With proper selection, presentation and care, it will be a living reminder of friendship, love and thoughtfulness long after the holidays have passed.